There’s a new paper just out on the sea urchin immune system, and since I’ve recently become a fan of sea urchin immune systems I’m not actually going to talk about that paper here. Instead, I’m going to rewrite a different blog post I made on the sea urchin immune system, pre-Mystery Rays. That way, when I do talk about the new one, I have my references set up in a row. Anyway, I think this is so cool it’s worth talking about twice. An ancient evolutionary origin of the Rag1/2 gene locus. Fugmann SD, Messier C, Novack LA, Cameron RA, Rast JP. Proc Natl Acad Sci U S A. 2006 Mar 7;103(10):3728-33. We thus conclude that SpRag1L and SpRag2L represent homologs of vertebrate Rag1 and Rag2. In combination with the apparent absence of V(D)J recombination in echinoderms, this finding strongly suggests that linked Rag1– and Rag2-like genes were already present and functioning in a different capacity in the common ancestor of living deuterostomes, and that their specific role in the adaptive immune system was acquired much later in an early jawed vertebrate. 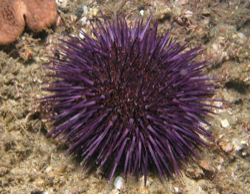 Sea urchins don’t appear to have an adaptive immune response, but this still simplifies the history of adaptive immunity. I’ve always been a little puzzled by the shark thing. It’s not just RAG1/2 that leads to an adaptive immune system: there are a host of other changes — molecular signals indicating where its safe to rearrange DNA, for example — that are essential for a functional adaptive response, and it seemed pretty remarkable that they’d all arise together, in a relatively short period. But this observation, along with other recent findings (lymphocyte-like cells in lampreys, for example) shows that many of the changes arose over a much, much longer period, and sharks were just the first to put together a set of unrelated changes to pull an adaptive immune system out of their molecular hats. First, there is no doubt that sea urchins have something that looks a lot like Rag1. But so does Nematostella, which is a sea anemone and VERY distant from vertebrates, and probably also other cnidarians. The N-terminal domain of Rag1 seems even older, I have seen ESTs from sponges and other very distant invertebrates. SpRag1 looks more closely related to the nematostella sequences than to the vertebrates. What’s more: there are many pseudogenized copies in the sea urchin and the nematostella genomes. To me, they look like remnants of transposons. With regard to SpRag2, I see even more problems. I agree with the authors, that this protein has some vaguely KELCH-like repeats and also some vaguely PHD-like finger at the C-terminus. However, neither the KELCH-like propeller region nor the PHD-like region look anything like vertebrate Rag2. If SpRag2 and vertebrate Rag2 are really distant orthologs, I would have expected so see at least some similarity that would go beyond the similarity to any other Kelch or PHD protein. This is not the case. Thus, I would never have guessed that SpRag2 really is a Rag2 and would do something together with Rag1. But, apparently, this seems to be the case. Congratulations! Fugmann 1, me 0. First, there is no doubt that sea urchins have something that looks a lot like Rag1. … To me, they look like remnants of transposons. I have to admit that I didn’t spend a lot of time running comparisons on Fugmann’s lineups. The transposon problem was just too much for me. Of course, RAGs are believed to be derived from transposons, so as you found there’s a huge amount of “noise” in searches – not real noise, because they’re genuine matches, but I’m not good enough to separate out things that are “just” transposons from things that are RAG-like transposons. I ran a quick look, and said to myself, Well, they know more than I do. But maybe it was as much an inspired guess as it was advanced knowledge! I like to re-analyze topics like these, and I am a pathological skeptic when it comes to claims of non-obvious sequence similarity (unless they are my own…). I must say that I liked the Kapitonov paper a lot, very neat work. By the way, the similarity between the transib transposons and the Rag1 family is relatively easy to spot if you start from the transposons, but next to impossible if you start with Rag1. It is also interesting to note that the significance of similarity between the insect transposons and the sea urchin sequence is seven (!) orders of magnitude higher than that between the transposons and vertebrate Rag1. While this – by itself – doesn’t tell nothing about the evolutionary branching pattern, I am nevertheless quite certain that the sea urchin “Rag1” would behave more like a transposon than like a true vertebrate style Rag1/2 system. Nevertheless, a very interesting topic.